Are you any the wiser? Certainly, the chart has the benefit of looking authoritative and harmless in a technical sort of way but it’s just sloppy journalism and research not worthy of the name by BBC home affairs correspondent, Dominic Casciani. The BBC has taken the very first set of data out of a possible 36 and made a picture devoid of meaning to the layman and of possible interest to a vanishingly small number of specialists. It ignores a slew of thought-provoking stuff in the interests of being uncontroversial and not offending the progressive agenda. Casciani’s copy makes no reference at all to the graphic. Understandably. However, there is lots of interesting material in the barrage of numbers that the government has made available. 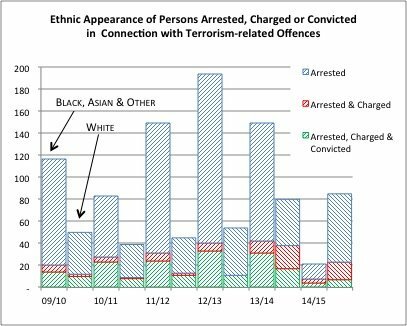 The BBC might have combined a number of different data sets and produced something like the chart below which sets out how many people were arrested in connection with terrorism offences in the last six years and breaks them down by the ethnic appearance attributed by the arresting officer. The first problem is that policemen are not ethnographers and the second is that the classification ‘Asian’ is far from precise in any case, so that there will inevitably be inconsistency and a degree of overlap between ‘White’, ‘Asian’ and ‘Other’. In consequence, there may not be any mileage in trying to discern any underlying trend in the racial characteristics of terrorism-related arrests based on what is available and probably the most useful purpose it serves is to prompt a revision for how information is collated in future. But what happens if we pool all the above racial data together? 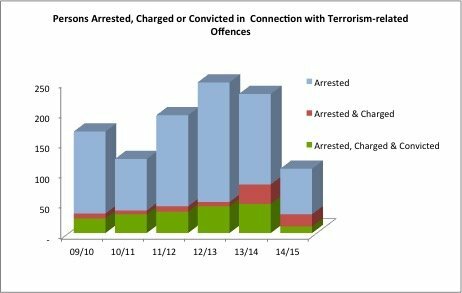 Now we have a rather more helpful picture which suggests that while the number of arrests may fluctuate from one year to the next, the police and security service between them are getting a larger number of convictions. One question that this diagram raises is what happened in the year to March 2015 to cause a slump in arrests and convictions but a good layer of charges nonetheless. Interestingly, 2015 also saw a reversal in the previous pattern where ‘White’ numbers ran consistently behind the remaining racial classifications. Why might this have been? 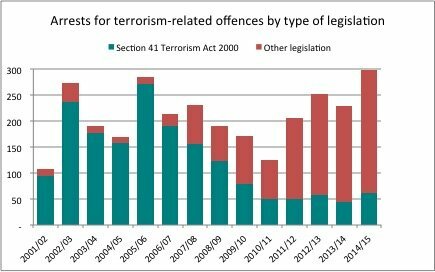 Happily, some of the terrorism data that the Government has released are fairly unambiguous and only deserves to be presented in graphic form to illustrate how flagrantly biased is the reporting of the national broadcaster. 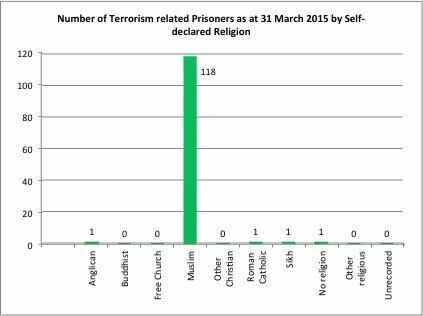 While the date on an individual’s ethnicity was given by a third party, namely a police officer, the religion of prisoners in gaol for terrorism offences was provided by the prisoners themselves. Which is more surprising: that the statistics are as they are or that the BBC chose to ignore them?